'Consumer confidence tumbles in November', says The Guardian, quoting an economist portending gloom and doom and saying the fundamentals for households would progressively weaken and take their toll on ability to spend. But is consumer confidence really that weak and if so, what are the implications? The figures quoted, from research company GfK's long-running consumer confidence index, show that it was down five points to -8. On the face of it, that might seem worrying, but it is actually the same level as the start of 2014 and also at the beginning of 2007, when retail sales were growing at 3%-plus year-on-year, and much higher than the low point of -39 plumbed in the depths of the recession in mid-2008. So basically, what we're talking about is a slow down from a blistering annual 7.4% volume and 6.6% value growth seen in October to a moderate but still buoyant rate of increase. So, all in all, not very alarming then. In any case, strangely, consumer confidence doesn't really say how much we'll spend. Instead it tells us how much stuff we'll buy, that is, the volume of goods independent of prices. 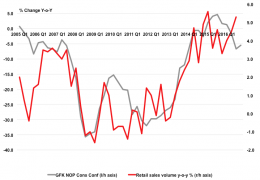 As the chart shows, growth in retail sales volumes moves practically in lockstep with confidence, with a correlation coefficient (Pearson's r, for those into their stats) of 0.77. The amount spent, on the other hand, has a coefficient of -0.15 i.e. no correlation or even a negative one. So what does this tell us about the current retail climate? It says consumers may slow down the growth in how many goods they buy to around 3-4% a year, but the rest will depend on how much retailers hike their prices in the new year. Margins may get squeezed by higher supplier prices in the wake of the falling pound, but top line sales figures are set to remain buoyant.